This is my list of guilty pleasure "get in the festive frame of mind" movies. I like to cuddle up with blankies and watch them with my Daniel and my Buffy and my Bono Baby. I've got one down so far. I'm going to watch them all this week. It's my Thanksgiving goal. 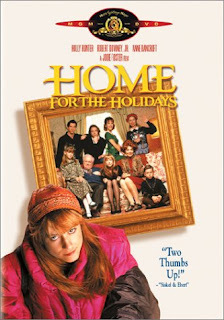 Do you have any favorite holiday movies that help you get in the "mood"? The Family Stone has the bus scene that I personally lived getting off a buss in LAX after your wedding. NOT FUN. But a great movie - you've got a good list there! Those are ALL on my holiday comfort list. Home For The Holidays! Definitely on my list to watch. Two of my favs are the The Holiday and Last Holiday. It may snow tomorrow and that will make it a perfect day for pajamas and movies. We(me, Tyler, and Nicole) LOVE LOVE "White Christmas".